It's the middle of the night. You're tired, drenched in sweat, and can't go back to sleep, and it's all because you just had a night sweat. Don't let this hormonal imbalance symptom continue haunting you for nights to come. Consider adjusting food options as an easy first step toward management. 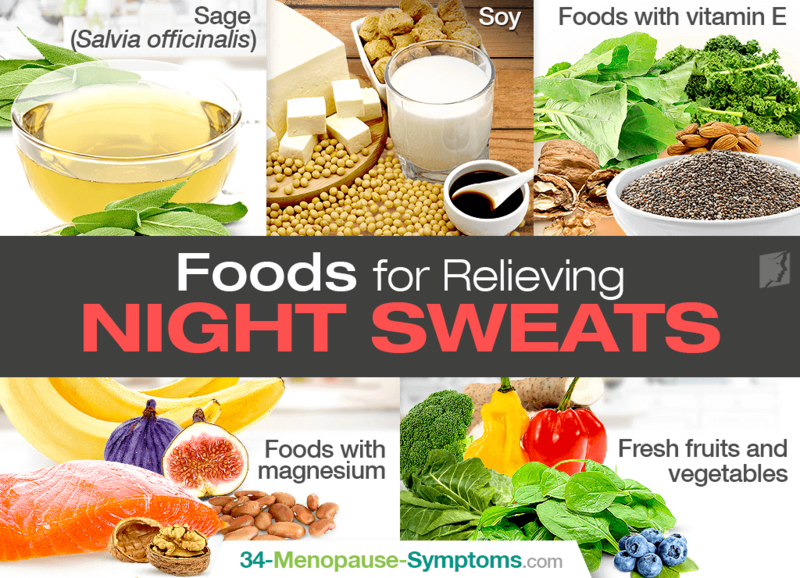 Continue reading to learn more about how to change your diet to stop menopausal night sweats, and finally start getting the beauty sleep you need. This versatile herb has been known to resolve gastrointestinal issues - diarrhea, bloating, gas, gastritis, etc. - and help lessen the frequency and severity of night sweats. Usually drunk in tea, it can be used as an ingredient in other preparations as well. Work with a certified herbalist for correct dosages. Extremely common in the Japanese diet, soybeans, tofu, and other soy products are renowned for being useful in preventing hot flashes and night sweats in women. Soybeans are also low in cholesterol and contain linoleic acid, an omega-3 fatty acid that can help prevent heart disease. Foods rich in vitamin E can also help women combat night sweats, the nocturnal version of hot flashes. Cold-pressed oils, green leafy vegetables, nuts, almonds, whole grains, and fresh vegetables are all great sources of this essential vitamin. As the fourth most abundant mineral in the human body, magnesium has shown beneficial in reducing the frequency of hot flashes and night sweats in perimenopausal women. It also shows beneficial effects on mood, stress reduction, and heart health. Foods filled with magnesium include seafood (salmon and tuna), legumes (chickpeas, black beans, and kidney beans), nuts, seeds, bananas, figs, spinach, and much more. Fresh fruits and vegetables - such as kale, spinach, broccoli, sweet peppers, yams, and blueberries - all contain large amounts of antioxidants as well as other essential vitamins and nutrient. Research studies show that antioxidants eliminate oxidative stress in the body, thus proving great benefit to women suffering from menopausal symptoms, like night sweats. Skip the processed foods and sweets. Consuming processed sugars can worsen your hormone imbalance and provoke night sweats. In addition, sugar increases energy levels and makes it harder to fall asleep. Spicy foods can lead to severe night sweats, disrupting sleep on a regular basis, because their consumption can raise body temperature, causing the body to try and cool off. This stimulant can trigger nights because it raises your blood pressure and heart rate, especially if consumed soon before bedtime. While the aforementioned foods will help you battle night sweats, the best way to alleviate the symptom once and for all is by treating the underlying cause. Various night sweats treatments help you resolve the hormonal imbalance at fault for your sleep disturbances. They include further lifestyle changes, alternative medicines, and medications. Take action today before suffering through another restless night. Q&A: What Are Perimenopausal Night Sweats? Q&A: Are Sleep Disorders Linked to Night Sweats? It can be annoying to have to deal with night sweats, characterized by excessive perspiration throughout the night. Fortunately though they are treatable.